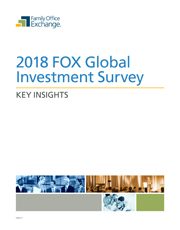 The FOX Global Investment Survey is designed to aid wealth owners and family office executives in their review of the family's allocation decisions and investment performance each year. This report highlights critical areas as to how families structure their investment decision-making, allocate across their portfolios, staff their investment teams, and in-source vs. outsource investment advice, all relative to 109 family office peers. Importantly, family offices can compare their investment performance with other families over a 1, 3 and 5 year time frame.